Early twentieth-century Singapore is a place where a person can disappear, and Harriet Gordon hopes to make a new life for herself there, leaving her tragic memories behind her--but murder gets in the way. 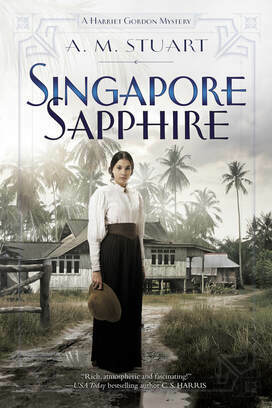 Singapore, 1910--Desperate for a fresh start, Harriet Gordon finds herself living with her brother, a reverend and headmaster of a school for boys, in Singapore at the height of colonial rule. Hoping to gain some financial independence, she advertises her services as a personal secretary. It is unfortunate that she should discover her first client, Sir Oswald Newbold--explorer, mine magnate and president of the exclusive Explorers and Geographers Club--dead with a knife in his throat. When Inspector Robert Curran is put on the case, he realizes that he has an unusual witness in Harriet. Harriet's keen eye for detail and strong sense of duty interests him, as does her distrust of the police and her traumatic past, which she is at pains to keep secret from the gossips of Singapore society. When another body is dragged from the canal, Harriet feels compelled to help with the case. She and Curran are soon drawn into a murderous web of treachery and deceit and find themselves face-to-face with a ruthless cabal that has no qualms about killing again to protect its secrets.